Heyday’s WT-2 allows boaters to have their wake and eat it too … for a lot less money. For 15 years, John Dorton was at the helm of MasterCraft, where price wasn’t as much of a concern as building the ultimate ride. But in 2012, Dorton left and shortly thereafter acquired a controlling interest in Bryant Boats, a family-owned company just down the road in Tennessee that had a reputation for building affordable, quality runabout-style boats. A few years later John’s son, Ben, a former pro wakeboarder, joined the team and it wasn’t long before they began working with hull engineer Cotton Welshan, who has been designing watersports boats for three decades, to create a different sort of boat. The idea was to distill a wakesports boat down to its essential elements, and Heyday — whose motto tells it all: Wake/Tunes/Crew — was born. 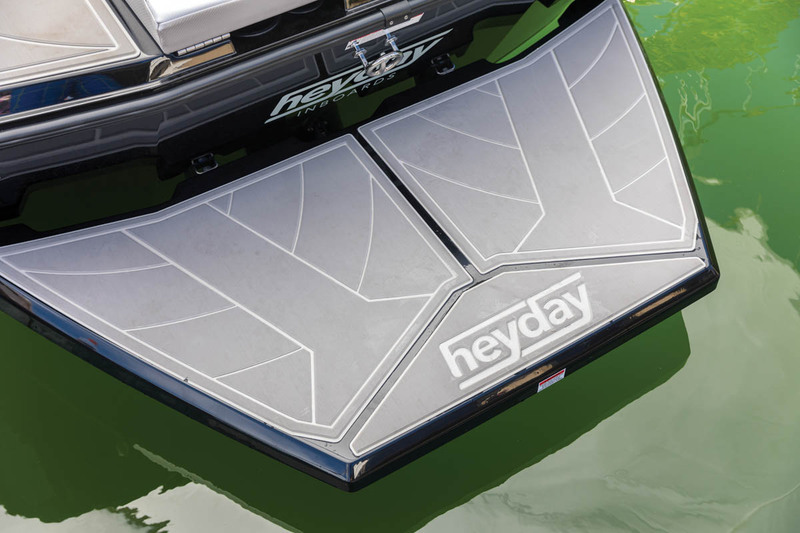 Last year, Heyday launched what it termed the Water Tractor, starting with the WT-1, which started at about $40,000, and later added the larger WT-2, which gets surfers and wakeboarders on the water for around $50,000. 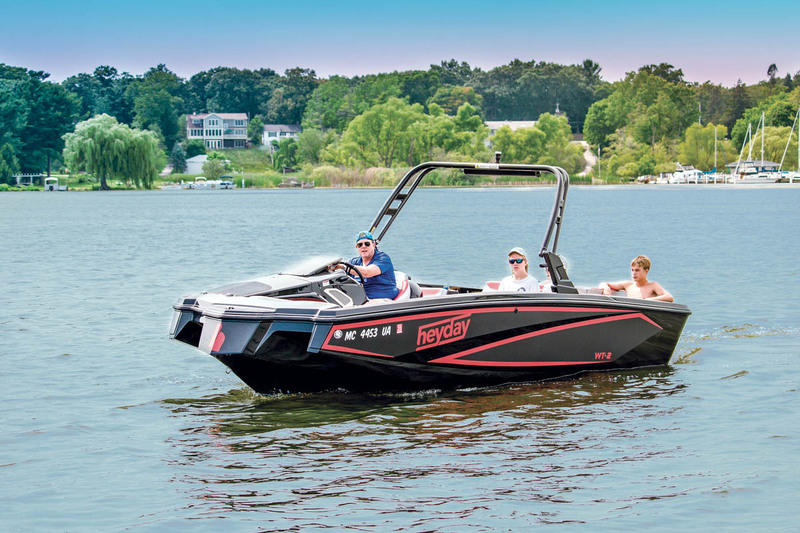 The concept proved irresistible to Brunswick’s Bayliner division. 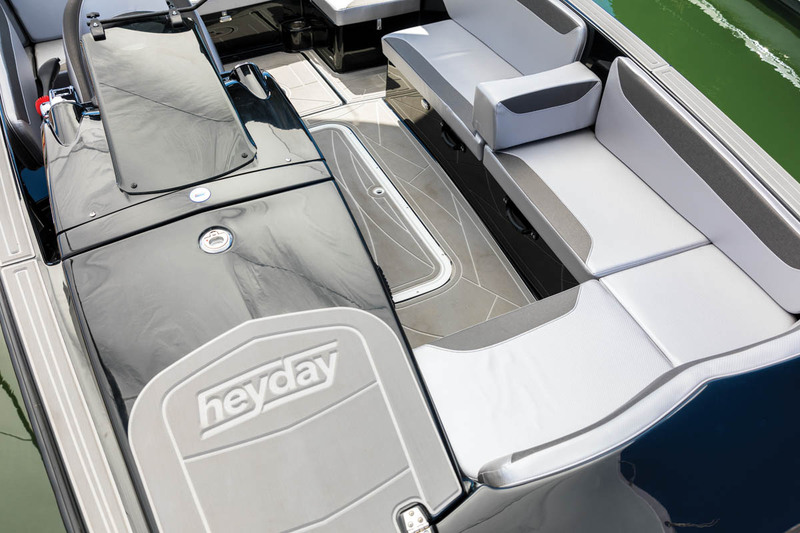 It acquired Heyday from Bryant because its philosophy dovetails nicely with Bayliner’s corporate mantra of getting new people on the water at a reasonable price. There’s no mistaking the profile of the Heyday WT-2, thanks to a bulldog-like bow section that looks like it had its point sliced off. When some people see it for the first time, it strikes them as pug-ugly (guilty), but only after I delved into its function and spent some time on it did its beauty emerge. The inside of the boat is nearly as jarring as its exoskeleton. The helm sits far forward and its console extends all the way to the blunt bow section where the boarding ladder resides. 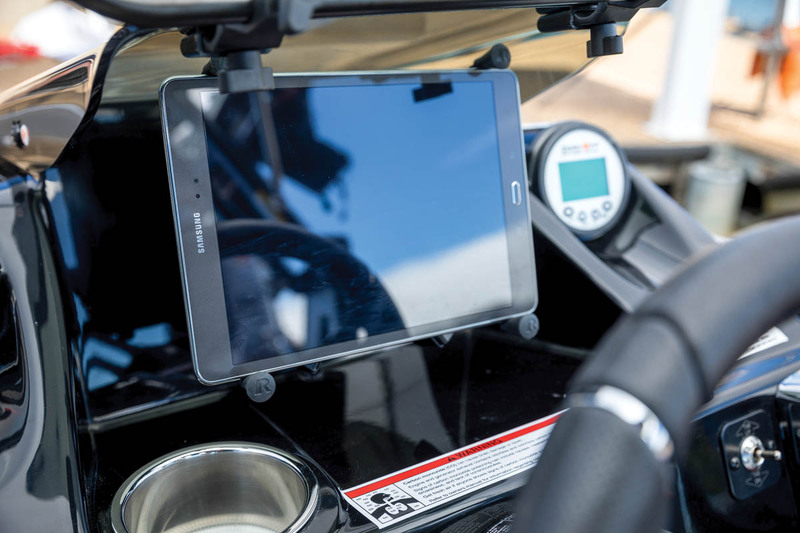 The first WT-2 I saw had an Android tablet held by a giant Ram X-Grip holder instead of a display, but now that Heyday is part of the Bayliner family it’s being replaced with a large MerCruiser 903 display that gives it a glass cockpit look. In addition to controlling the stereo, the 903 display can also monitor a GoPro camera. 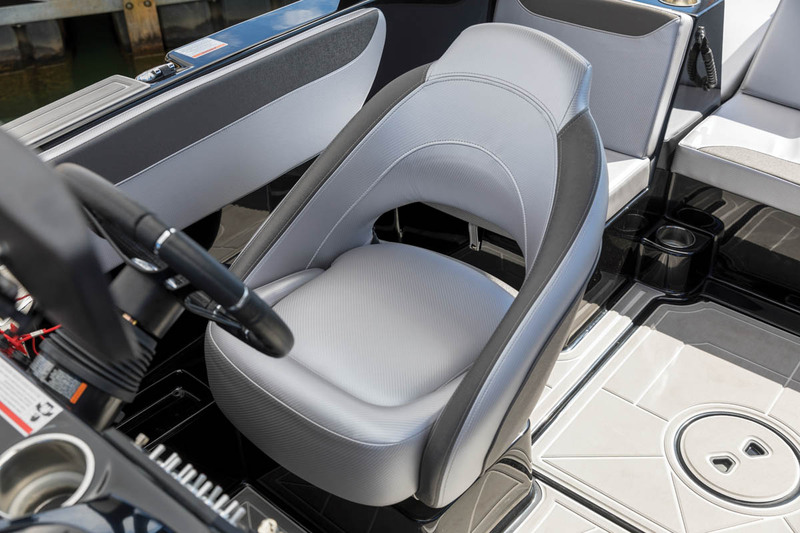 The WT-2 has a seating capacity of 12, and it accommodates everyone in an unconventional way. Up front is a rear-facing bench seat whose portside section stretches into a really long settee that is bisected by a removable backrest. My only beef with the mini backrest is that it sits at a 90-degree angle to the seat bottom, which isn’t particularly comfortable. The stern of the boat is dwarfed by the huge engine compartment’s “dog house,” which doubles as a roomy sunpad when skiers take a break. The best seats in the house are on either side and feature a hump in the middle of the seat bottom, which creates really comfortable hot tub–style seating whether the occupant is facing fore or aft. When Heyday was part of the Bryant family, the power choices came from PCM’s Crusader series of wakesports 5.7L V-8 inboards, and many of these are still in the dealer pipeline, but the one I tested had the MerCruiser Tow Sports 6.2L 320 hp. (Bayliner is a part of the Brunswick family, which also owns Mercury/MerCruiser, so look for PCM-powered models to disappear in the next year or so.) The 6.2L Tow Sport Inboard comes in a 370 hp version, but the 320 hp pushed it just fine, even loaded with its 1,800 pounds of max ballast. When I hammered the throttle, there was a bit of initial bowrise, but the nose quickly came down as the WT-2 settled in on plane in 2.5 seconds. Its time to 25 mph was only 4.5 seconds and its top speed was 39 mph. At the helm, the driver holds on to a thick sports wheel and sits in a wraparound helm seat that has a flip-up bolster. Overall, the driver position and comfort level are really good. The boat’s LOA of 22 feet, 6 inches includes the SeaDek-covered swim platform that sits right at water level. Its hull length is only 20 feet, which helps account for the boat’s nimble handling during hard corners. 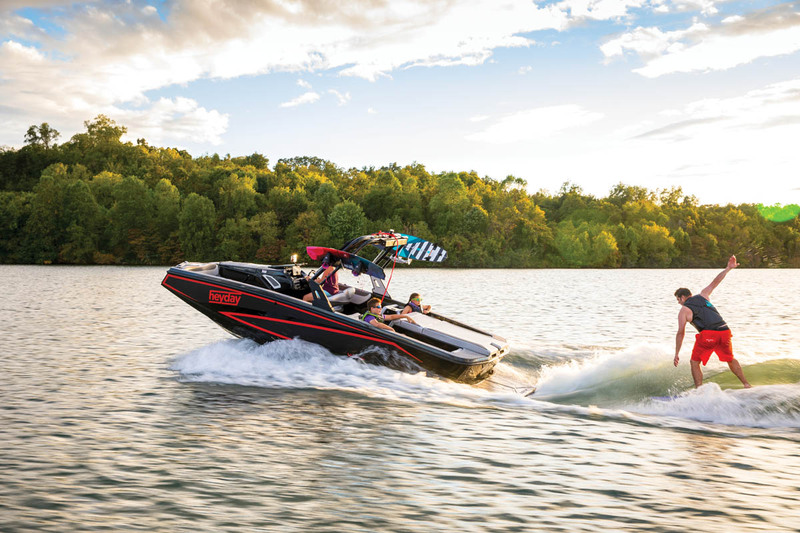 The WT-2 features an unusual hull that doesn’t require extra running gear to help produce a great wake. 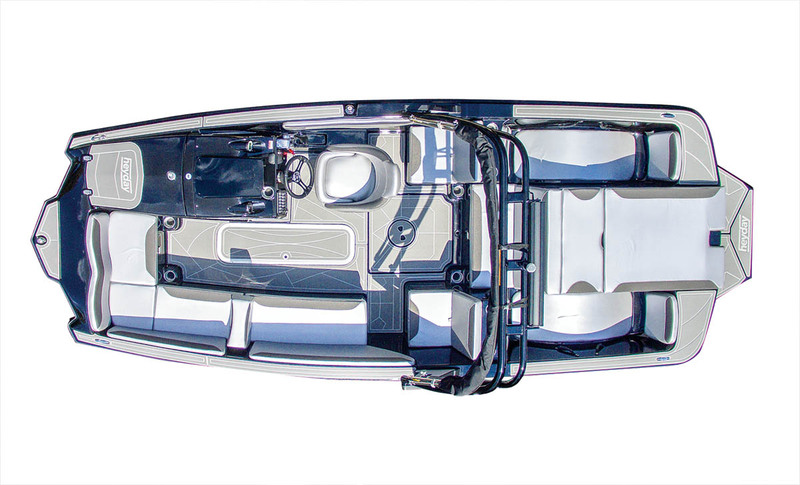 The transom features an extreme 117-degree inward angle (longer at the top) that helps the stern settle low into the water and artfully controls the flow of water to organically form a wake. The deadrise at the transom is only 5 degrees, which makes it very stable laterally and prevents it from heeling far over in turns. I thought this would make it ride rough in the chop, but the entry is sharper and creates better slicing action. We tested it on Lake Michigan, which was a little lumpy, and it rode well through the chop. An area of concern, initially, was the stubby bow section. Would it be prone to stuffing? Turns out this is one of the Heyday’s strengths thanks to twin sponsons up front that provide extra flotation and keep the bow riding high. The WT-2 is purpose-designed to get people into wakesports, and it does so in the simplest possible fashion. The boat itself weighs 3,550 pounds, which is a pretty good start for wave making. Two ballast tanks each have a 900-pound capacity, and there are exactly two billet toggle switches that control them. Simply toggle up on the surfing side or toggle down to dump ballast. For wakeboarding, toggle both up. There’s no capacity to change from surfing on the regular side to the goofy side on the fly like fancier boats with tabs and gates possess, but this boat isn’t really designed for pros; it’s more for the 90 percent of surfers who stay on their “good” side. The fill and dump takes longer than others to cycle, but that’s a small matter. The surfing wake itself forms quickly and is surprisingly fat and long with a large sweet spot and plenty of push. The boat’s list during surfing isn’t too drastic, probably because of its relatively flat bottom. The wakeboard wake is medium in size and the ramp is clean and well-defined. For skiing, the wake never really flattens out enough to do more than cruise slalom over the lumps at speeds of around 30 mph with zero ballast. Heyday delivers a nice turnkey boat, including a trailer and a watersports tower, for the starting price of $50,000. It features a Wet Sounds sound bar for tunes and no option for spending more money. That’s sort of a theme. Most ski boats feature an options list longer than a CVS receipt, but Heyday keeps it simple and affordable. Start with a choice of eight free color schemes and eight more optional schemes with more black in them for an additional $467. What’s cool is they are wraps, not gelcoat, so it’s possible and affordable to change the color scheme. There is only a handful of must-have options, including the GPS version of Zero Off’s speed control ($1,143). Swivel board racks are an extra $993 and a ski pylon costs $800. Add a sunshade for $853 or a soft-sided cooler for $111. For a little more flexibility in controlling the wake’s shape, there’s an elevator plate available for $399. Purchased by Drew and Monica Goss, plus Morgan, 16, and Tristan, 13, Whitehall, Mich. Purchased at SkipperBud’s, Grand Isle, Mich.
Super-low price point/Simplicity of operation/Comfortable hot tub–style stern loungers/Tower with Wet Sounds sound bar/Great surfing and wakeboarding wake. I’m not sure how to do this, but the bow of the boat comes to a point and is totally unprotected if you bump into something. My family has always been into watersports. We’ve owned some high-dollar ski boats before, but our needs have changed. My wife and I are into slalom skiing and my kids really like wakesports, but we also wanted more room for entertaining on the water. Thanks to Heyday’s low price, we can afford to buy it for our wakesports needs and still get a triple-tube pontoon for entertaining and slalom skiing. My son Tristan is a wake shredder and loves the big, well-formed wake the Heyday provides, and we all like to surf, so we have our bases covered. The WT-2 really turns heads with its unique look, and I like the fact it has a wrap that we can change if we want a new color. I added Vantage Protection film, which is like a vinyl clear coat that gives the wrap extra protection. We do our boating on White Lake in western Michigan and like to cruise to restaurants such as Buzz’s Lakeside Inn and Crosswinds on the Lake. Tom at SkipperBud’s made the buying process a pleasure, and the service department is first-rate. LOA: 22 ft., 6 in.